Here are some of the photos taken of me just starting out on the ropes course Monday at Kennolyn. Though I had actually been a ropes course instructor at the camp, it’s been six years since I actually went up on one. When these photos were taken the fear hadn’t really set in yet. 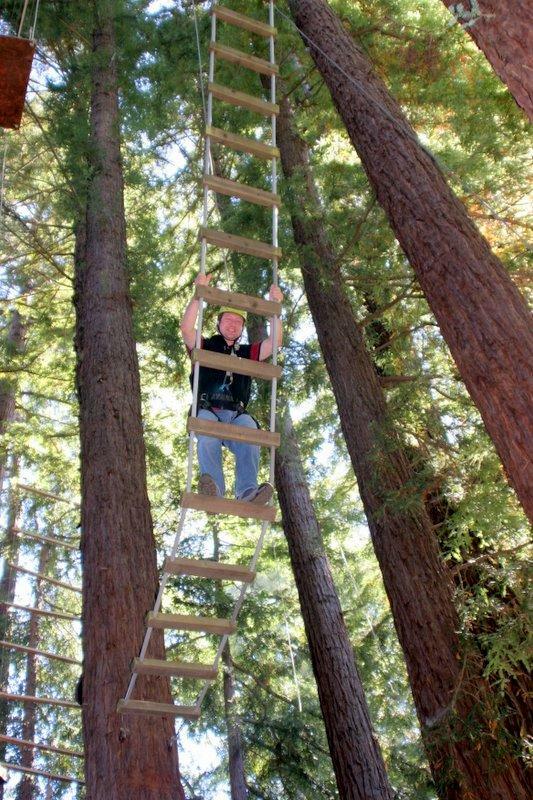 That came after I got up to the Charlie Chaplin Walk – an element where two cables/wires are about a a foot apart and ten feet long between a redwood tree and a platform attached to two redwood trees – and about 50 feet in the air. I nearly wet myself crossing the Islands in the Sky, the element after Charlie. About eight boards with four ropes atta ched to each corner come together and attach to a cable overhead. All of the boards swing freely, again, about 50 feet in the air. The plan: Walk across them to the next platform to get to do the really fun part: the Zip line. Special thanks to Brad Elman for taking and diligently e-mailing these photos to me. Brad’s a former camper and counselor at Kennolyn who now has a son who has been to the camp six summers, I believe he said. Thank you, Brad.